The team here at CiteAb has been busy this week analysing our latest data set, and we’ve found a number of surprise success stories among the research antibody market. We all know that Santa Cruz Biotechnology has historically been the leading company in the antibody supplier market, but our data shows that it has steadily lost market share over the past few years. Abcam is well known for capturing this, expanding into growth markets such as China and providing an increasing strong range of rabbit monoclonal antibodies (RabMAbs®) – we wrote about this in the spring. However, the data we have analysed today suggests that in addition to Abcam, there are three other surprise success stories. So who should we be watching in today’s market? Dr Andrew Chalmers, our founder, says: “Most of the companies we have looked at are not rising. 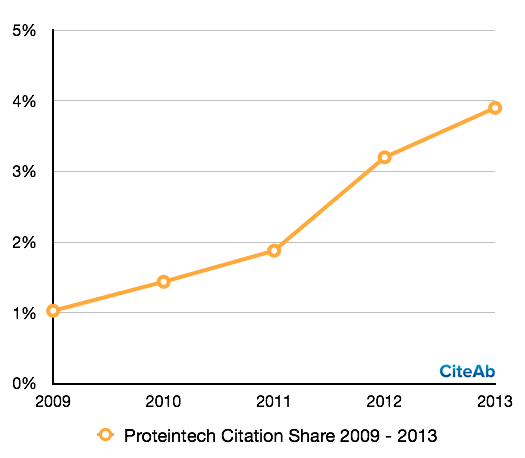 However, Chicago based Proteintech is very exciting. Proteintech demonstrates similar strengths to Abcam but on a smaller scale, cracking the growing Asian markets, especially in China. The company is also strong in the UK and Japan, makes all of its own antibodies and uses whole protein immunogens – potential contributors to the success we see today. Andrew adds: “We’re also keeping a close eye on GeneTex and Atlas Antibodies – both have seen sustained large growth in market share in the past four to five years. GeneTex arebased in Taiwan so they have an edge in the growing Asian market, with particular strength in their home country and in Japan. They supply a good range of antibody types, a diversification that has potentially helped spur growth. 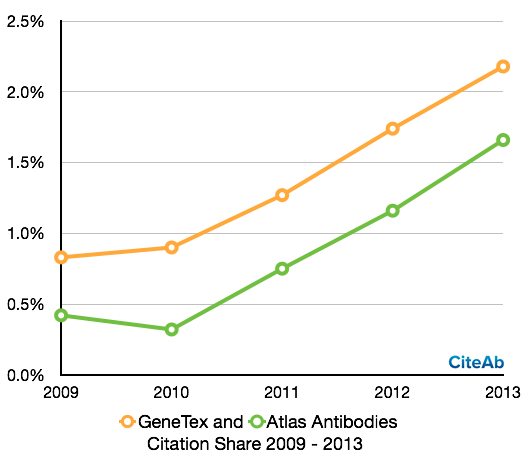 Here at CiteAb we have a database containing over 1.9m antibodies from suppliers all over the world, and we use academic research citations to rank antibodies. Our findings today are based on our analysis of hundreds of thousands of publications which use research antibodies, so it gives an unrivalled view of trends among 70 suppliers in the market. We’d love to hear your thought on these latest changes in the antibody market – have you purchased antibodies from any of these companies recently? Do share any insights you have on their customer service, antibody quality or other factors that might be playing a part in their growth either by commenting below, tweeting us @CiteAb, or on LinkedIn, Google+ and Facebook.